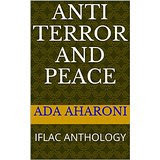 IFLAC (International Forum for the Literature and Culture of Peace) Anti-Terror and Peace Anthology 2016 is out in e-book format on Amazon.com. This is an ambitious and successful project which puts together the works of writers from 23 different countries, including Malta. Ada Aharoni is Editor in Chief. 3. a set of 6 haiku about the Anti-Terror theme. Many thanks IFLAC. No for terrorism! Yes for Peace and mutual Respect.